Home › Fantasy › Top 10 Fantasy Novels of 2015? Top 10 Fantasy Novels of 2015? After looking at last year’s top mysteries, it’s time to check out which fantasy novels were the most popular in 2015. The following list includes a mix of high fantasy and urban/paranormal fantasy titles, all of which are shelved in the Fantasy section at the library where I work. Based on circulation figures, these were the most checked out fantasies in 2015. Shattered by Kevin Hearne— The 7th book in the Iron Druid Chronicles finds Atticus O’Sullivan no longer the last druid alive. He’s now joined by his apprentice Granuaile and a defrosted archdruid from ages past. Skin Game by Jim Butcher— In the 15th Dresden Files book, the Queen of Winter, Mab, has offered Harry’s services to his enemy Nicodemus to break into a high-security vault belonging to Hades, lord of the Underworld. Dragon Age: Last Flight by Liane Merciel— After vanquishing an Archdemon and ending a Blight, the Grey Wardens are once again acclaimed heroes, and they have tasked a young elven mage, recently recruited, to study historical records of previous Blights in the hopes of preventing future ones. Based on the award-winning Bioware fantasy RPG video game. The Colour of Magic by Terry Pratchett— The colorful fantasy realm of Discworld was first introduced to readers in 1983 with this book, featuring Rincewind, a rather inept wizard constantly getting into danger and running away from it. In this first book, Rincewind serves as a guide for a tourist hailing from Discworld’s Counterweight Continent. Raising Stream by Terry Pratchett— He fixed the postal service, resurrected the mint and royal banks, and now he’s about to become the first railroad baron of Discworld. The third book to feature Moist von Lipwig is the 40th book, and second to last, in the Discworld series. The character previously featured in Going Postal (2004) and Making Money (2007). Maplecroft: The Borden Dispatches by Cherie Priest— The first book in a new series that features the infamous Lizzie Borden. Here, Lizzie and her sister, Emma, have taken up residence in Maplecroft, an isolated mansion by the sea. With her trusty axe, Lizzie hunts malevolent entities—like the ones that possessed her parents. Hunting Ground by Patricia Briggs— This 2nd book in the Alpha and Omega series ranked on the top ten list even though it was first published in 2009! Werewolf Anne Latham and her mate have been enlisted to attend an important summit where the fate of werewolves will be decided. A Blink of the Screen by Terry Pratchett— This collection of stories spans Pratchett’s writing career from its beginnings to 2015. Familiar characters, abandoned worlds, chickens, death, and disco all feature in this volume of collected works. Closer to Home by Mercedes Lackey— The first book in the Herald Spy series, part of the larger Valdemar saga. Mags, a former orphan, has become a Herald and is tasked with uncovering a treacherous plot that threatens to destroy the Heralds and the royal court. 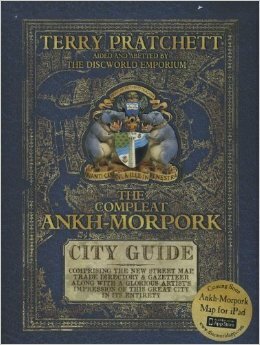 The Compleat Ankh-Morpork by Terry Pratchett — This illustrated volume is a designed like a street directory for Discworld’s most famous city, Ankh-Morpork. Including a stunning map, the directory covers “each and every district from Unseen University to the Shades, major landmarks like the Patrician’s Palace to little-known, er, nooks like Dwarf Bread Museum in Whirligig Alley.” It’s a loving tribute to Pratchett’s beloved Discworld. It’s bittersweet that the passing of Terry Pratchett in March 2015 led to a surge of interest in his books. The short story compilation, A Blink of the Screen, came out just days after Pratchett died. Though he’ll probably be best known for his Discworld series with its satire of our peculiar ways of life, Pratchett also delved into science fiction, writing the Long Earth series with co-author Stephen Baxter. In fact, the fourth book in that series, The Long Utopia was the most circulated science fiction title at my library in 2015. As for the other authors on the list, I’m pleased to see Kevin Hearne’s Iron Druid series crack the list. Cherie Priest’s books have been surging in popularity. And Jim Butcher’s Dresden Files continues to rank in the top ten. Popular authors Mercedes Lackey and Patricia Briggs also make a return, appearing on 2014’s list. And there you have it, the most popular fantasies read in 2015. Delighted or disappointed? How many have you read? And which books would make your list of the top ten fantasies of 2015? « Top 10 Mysteries in 2015?